Fatcow ,founded on 1998 is a Mexican based hosting provider and is always in the moo moods. It always loves to feed its customers with plenty of milk and butter to keep on the mooove! The Mexican firm over threw all the misconceptions and provided a smooth and user friendly interface to its customers. A good eye through their site will surely make you feel the unique approach of the Fatcow hosting. Fatcow like Hostgator is environment friendly and their offices are run 100 % using wind energy. Despite all this Fatcow is meant to be made for professionals, the lack of great technical support will make you often feel it when you are in touch with them. Thus, the view of Fatcow is simple and it is constantly in race to create website with great simplicity. These websites being simple will surely fail to stand out from the crowd and remain un-noticed. Fatcow rolled out an initiative which they named as MiniMoo, for that entire crowd who wish to have an internet presence but not a dedicated website. MiniMoo will provide a domain, email and the sufficient space to give the basic information and a contact page. The Fatcow team rates themselves as the superior class, and guarantee you any time money back guarantee. Fatcow ensures reliability to its customers by offering 100 % wind energy based solutions and redundant power supply with backup generator systems. Fatcow customers are treated well with the high speed internet connectivity and data loss protection provided by regular server backups. These all simply boosts the reliability level of the Fatcow hosting. BlueHost, Hostgator and Fatcow could be rated the same when it is about the reliability. Fatcow being user friendly offers you great value for you money. 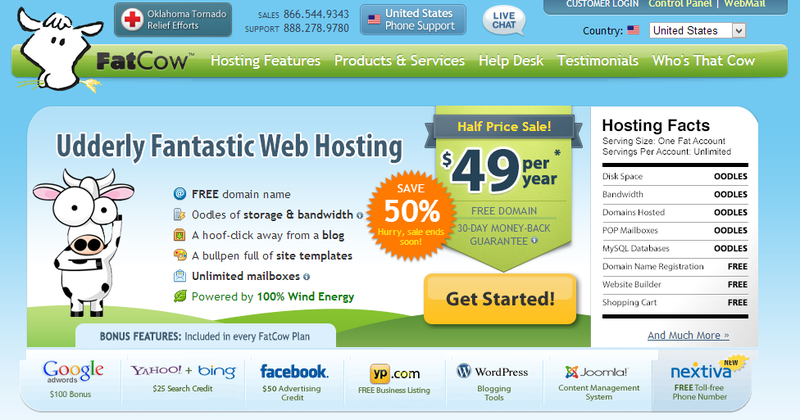 Personally eyeing through all the hosting providers available, I felt Fatcow values the money of its users a lot. It loves to supply lot of discounts and coupons to its users. It allows unlimited disk space, unlimited bandwidth, social network ad credits, search engine marketing, yellow pages listing etc making your pay valuable and worthy. FatCow Account control panel will be the worst in the three. Informative nature of control panel is diminished here and the user interface is poor. But spending good time with will make you know how potentially powerful the host is. Fatcow allows making the websites and blogs as straight as possible to its clients. Like all other hosts Fatcow also provide you 24×7 customer care support and answers you all the queries with simplicity. Since, Fatcow focuses on straight forward way of tackling the problems the customer care support provides the simplest solutions to your queries related to web development and hosting services.